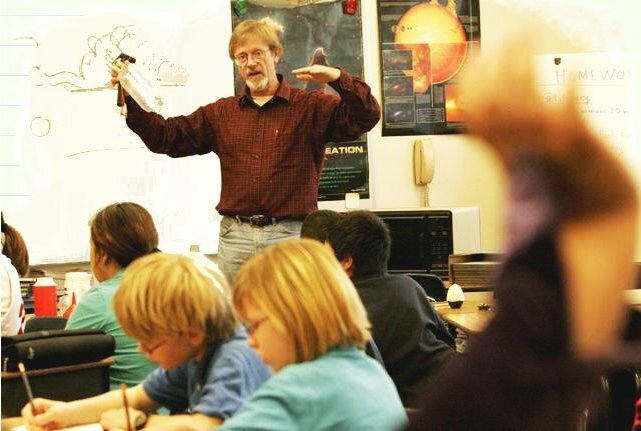 During the 1996-97 school year, I spent an hour every week in Linda Waidler's 3rd-4th grade class at Wood-Gormley Elementary (randomly chosen because my daughter was in it), answering any science question the children might have. The next year, I did the same in Shirley Esquibel's 3rd-grade class (by coincidence, my son was in that class), and I've been doing the Science Hour ever since. Even though my kids have moved up and on, I still go to WG Elementary, in recent years to 6th-grade classes. As my kids grew up, I found that in middle and high schools, you can go to a science class maybe once or twice a year, but you cannot steal an hour every week from a science teacher - there just is not enough time. Also, in a primary school class you reach all kids, not just the ones in science class. My activities are part of a larger effort in the Santa Fe school district to match up the talents of active and retired scientists, engineers and mathematicians with the needs of the local schools. The Santa Fe Alliance For Science has about 100 such volunteers. Here is one-page article describing the alliance. Here I have a growing number of pages with subjects that have come up, and elaborate on some demonstrations I came up with to explain some of the concepts. In addition, I usually find a bunch of web links on the subject, so that children (parents, teachers) can do a bit more reading and learning. For the children, so can read over some subjects again, and follow the links I found to get more background info, and pictures. For the parents, so they can see what goes on in class during the science hour. Having done this for a few years now, these pages are a handy archive for myself. I can quickly look up what I need for a demo. I'd like to hear from all. Don't be shy. What is special is that I am a scientist, not a teacher, and I do not have a lot of equipment (and neither does the school). The demonstrations therefore use simple materials I find in my kitchen, shop and yard. This is mostly no-tech science, but you'd be surprised what you can do with cardboard, duct tape and paper clips. I typically update these pages every week during the schoolyear, as questions come in, and rework older paragraphs. These pages are in constant flux, as is everything on the web, of course. Does everything have a name? on page 20 Why does your voice sound funny when you breathe helium? Making a lens out of air? on page 21 Making a woodel cyclotron? Why do you get carsick? Suggestions, comments, greetings are greatly appreciated. Just click here and type away!